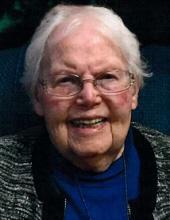 Rita Dawson Hofmann passed away peacefully on February 20, 2019 at her home in Dunwoody Village, Newtown Square, PA.
Beloved by her family, friends, and all who knew her, she was 97. Rita was born in Belfast, Northern Ireland to William Dawson and Rebecca Baxter. She came to Philadelphia with her parents and older brother, William, in 1925. Rita attended the S. Weir Mitchell School, Shaw Jr. High School, and West Philadelphia High School. After graduating in February of 1939, Rita began her career in the insurance business with a position at General Accident Fire and Life Assurance Corporation. She retired in 1983 after 31 years with the Federal Home Life Insurance Company, where she was the Philadelphia life secretary. Rita married F. Robert Hofmann in 1958. She was a faithful member of her church, and enjoyed her membership in a bible study group where she made several lifelong friends. Since 1999 Rita was a member of St. Matthew's RE Church in Havertown. Rita enjoyed traveling, and made many trips in the US and abroad with her mother and with her beloved and loving husband, Bob. Bob passed away in 2003, and in 2004 Rita moved from their home in Havertown into Dunwoody Village. Rita is survived by her two nephews, John and Todd Dawson, niece, Elizabeth Dawson Staehle, and grandniece, Lauren Dawson Staehle. She had many Baxter and Dawson cousins, as well as beloved nephews and nieces in the Hofmann family. A memorial service and celebration of her life will be held at Dunwoody Village on Saturday, March 30 at 11:00 a.m. in the main auditorium. Please share your memories of Rita.